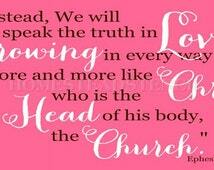 Chirst is the Head of the body, the church. From Him, the whole body grows and its different parts take their appropriate place, all joined together as He has determined. Each part is there for a purpose. Each part has its own proper place and work fitted to its ability. All the parts working together contribute to the growth of the entire body, and it is a perfectly designed plan to work out the purpose of God. It doesn’t matter what part you are, as long as you are doing what God has assigned to you. Some members of the body are public. However, if you consider the human body, you realize that most of the work goes on internally, where no one can see it. The heart, the lungs, the liver, the kidneys, the intestines and more, are all hidden members of the body, quietly going about their jobs day and night. They get recognition, most of the time, only when they malfunction. The smallest members are important. Think of having to walk without your toes. It can be done, but not nearly as well as when your toes are all working perfectly. Balance and stride depend upon the toes as well as the rest of the foot. Let’s go even smaller. How useful are eyelashes? They’re good for more than holding mascara 🙂 They help keep dust and other stray particles out of the eye. They are an often lovely safety guard. They’re important. And they wouldn’t do their job properly if they were attached anywhere else but to their designated place. Having eyelashes on one’s earlobes wouldn’t serve much purpose, after all. We need to be willing to fulfill the work that God has given us to do. First, we need to define our terms. A personality disorder is a deeply ingrained and maladaptive pattern of behavior of a specified kind, typically manifest by the time one reaches adolescence and causing long-term difficulties in personal relationships or in functioning in society. By contrast, depression and Bipolar Disorder are categorized as mood disorders. Other problems fall under the label of anxiety disorders, such as obssessive-compulsive disorder. More serious issues, such as schizophrenia, are true mental illnesses requiring close medical attention. A personality disorder cannot be “cured” in the sense that it will ever completely disappear. It can, however, be treated to a certain extent if the person who has the disorder is willing to be treated. Sadly, much of the time there is no recognition by the afflicted person that there is a problem, except with everyone else. As I’ve said many times before, it is difficult to diagnose oneself or someone else by looking up symptoms on the internet. In fact, I beg my clients not to do it. It generally leads to increased fear and often a strong misunderstanding of what is really going on. So this and the following posts on this subject are not intended to diagnose you or anyone else; rather, they are for general information. If you or someone close to you seems to be suffering with symptoms you will find here, the best thing to do is to start by going to your primary care physician, who will refer you as necessary for further medical evaluation and then perhaps to a therapist like me. I’m not going to spend a great deal of time here, because I am not experienced in this set of personality disorders. I have a standing rule: If you have been diagnosed with any of the three conditions in this cluster, you MUST see a psychiatrist for medical treatment before I will accept you as a client. My experience has been that people dealing with these conditions are not going to benefit from counseling if they are not staying faithful to their medication. Paranoia: Characterized by a pervasive distrust of others, including even friends, family, and partner.The true paranoid is constantly on guard, looking for clues that he is being spied upon, followed, harrassed, wrongly accused and/or gossiped against by everyone he knows. He will not hesitate to call law enforcement if he believes the car he just saw passing his house is following him. He lives caged in fear and suspicion. Schizoid Personality Disorder: The term ‘schizoid’ designates a natural tendency to direct attention toward one’s inner life and away from the external world. A person with schizoid PD is detached and aloof and prone to introspection and fantasy. They tend to avoid social interaction, seeming to be content with their own life in their own space. Schizotypal Disorder: Schizotypal PD is characterized by oddities of appearance, behaviour, and speech, unusual perceptual experiences, and anomalies of thinking similar to those seen in schizophrenia. These latter can include odd beliefs, magical thinking (for instance, thinking that speaking of the devil can make him appear), suspiciousness, and obsessive ruminations. There is more, much more, to these three disorders in the first cluster. Again, this is not an area of expertise for me and I in no way want you to think that what I have written here is the complete, substantive description of these three disorders. And again, if you or someone close to you suffers from these symptoms, your medical doctor is the best starting place in your quest to find help. Instead of being like helpless children, distracted by every new thing that catches our attention we are to simply speak truth. We can speak truth only if we know truth; only if we are immersed in God’s Word and prayerfully seeking the truths that God has clearly laid out for us there. And we are to speak those truths not in self-righteousness, or in wrath, or in judgment against others; we are to speak truth in love. Sometimes that’s really hard. Sometimes, no matter how careful we are about speaking truth in love, our words will be picked up and hurled back at us in anger. It doesn’t matter. Our job is to be truth-speakers. It is the Holy Spirit Who will use truth to convict the heart of the hearer. Do you ever just shake your head in amazement at how easily Christians are pulled into the latest “new” religious fad? Have you ever been sucked in yourself, only to realize later that it was all smoke and mirrors? I’m old enough to remember several religious fads that swept our nation and sometimes the whole world. I’m not going to name them here, but if you lived through the 60’s, 70’s and beyond, you’ll remember how some people came to prominence and were then discovered to have feet of clay. I don’t know why this surprises us. We are warned over and over to search the scriptures, to watch out for wolves in sheep’s clothing, to try every word we hear by the Word we can trust. And still today, we are pulled in by glitzy, shiny “new” teaching that promises us things God never, ever promised us. We are told we can name it and claim it; that we can experience eternal bliss right here on earth before we ever get to heaven. And we fall for it. Why? Because we are like little babies, clutching at any offering of food we can stuff into our mouths. Sometimes we just never get past the sincere milk of the Word, and we are deceived easily because our appetite for instant gratification must be satisfied. We refuse to accept any hint of suffering because we’ve been taught to believe that God promises us nothing but ease in this life. We are like little toy boats being tossed around on a turbulent ocean of deception because we are not anchored to the Rock! I was glad to find this graphic that goes back a couple of verses. It’s a good review. especially since it’s been several days since I did the last Ephesians post. 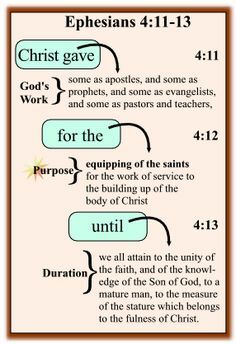 Christ has given gifts to believers to do God’s work, for the equipping of the saints and the building up of the church, until we reach that perfect unity of the faith and knowledge of Jesus Christ when our work here is done and we are taken to heaven to be with Him for all eternity. Watching all the accusations and counter-accusations in this interminable and excruciating campaign is wearing me out. Even men whose moral character I admire have been pulled into the vortex of mudslinging and character assassination. This is way out of my normal topics here on this blog. I’ve debated about whether or not to do it, and I hope I won’t be sorry. I will tell you ahead of time that I will not allow any comments that are vulgar, profane, or hateful. You may disagree, and that’s fine. Just please be civil. Which is part of my issue this morning. Mr. Trump is one of the most uncivil “political” candidates ever to debase the process of electing an American President. He’s a bully, and I am truly tired of his constant name-calling. He’s especially unkind to Jeb Bush, who is not my favorite candidate by a long shot. Still, there is no excuse for the vitriol that Trump spews against him and his family whenever he gets the opportunity–or, rather, MAKES the opportunity. He’s rude. He interrupts and then won’t concede the platform. Do we really want a President who has made his billions in real estate? Who owns the land upon which casinos practice their trade? Don’t we understand that all sorts of evil attaches to casinos? Mr. Trump is no Sunday school teacher, not that the President needs to be one. He has made some weak claims to Christianity, but when he tried to use a biblical reference at Liberty University, he clearly didn’t have a clue what he was talking about. He told an interviewer that he doesn’t need to ask forgiveness; if he ever “makes a mistake,” he just fixes it. Apparently, this is a man who, in his own eyes, does no wrong. I think that’s dangerous. We’ve already suffered nearly eight years with an arrogant, lawless President who uses his pen and his phone to get his way, regardless of our Constitution. Why do we think Trump would be any different? I am saddened that so many believers are supporting a megalomaniac who has no sense of his own wrongdoing. So why is he popular? That’s pretty easy. He’s pushing the buttons that most true conservatives respond to. We don’t want to be invaded by illegal immigrants. We don’t want ISIS here. We don’t want more spending, more taxes, more entitlements. We want a strong military that is not hampered by silly rules about having to get permission to shoot when the enemy is in the crosshairs. Trump is promising to make America great again, and that appeals to all of us who remember when everyone in the world wanted to come here because here, they could be free and safe from tyranny. And they could get good medical care without waiting for years to have necessary surgeries. My personal opinion is that Mr. Trump would be just as guilty as Obama has been of flouting Congress, ignoring the rule of law and doing exactly as he pleases to achieve his goals. Obama promised us hope and change, and he didn’t try to hide that he wanted to “fundamentally change America.” He’s achieved a lot of that. Trump is promising grandiose things as well. Making America great again sounds wonderful, but Trump is used to doing whatever he wants, with no restraint. I don’t want that kind of President. I don’t want a man who shows no respect for his fellow candidates, who bullies and calls names and tells them to be quiet. You know, I went looking for a video of Trump calling Bush names. Do you know what came up on Google when I typed that into the search bar? Just the opposite! A whole page of “Bush Attacks Trump” articles. So I tried it with different words, and got pretty much the same results. I think that’s just a little bit strange. The perfecting of the saints: That is, to help bring about spiritual maturity, especially in a time when persecution was ramping up. Believers were going to need that maturity in order to face whatever they needed to face. The work of the ministry: Being in ministry is both a wonderful blessing and privilege as well as a taxing, challenging, and sometimes draining thing.If one is not truly gifted for ministry, it is a mistake to attempt it. 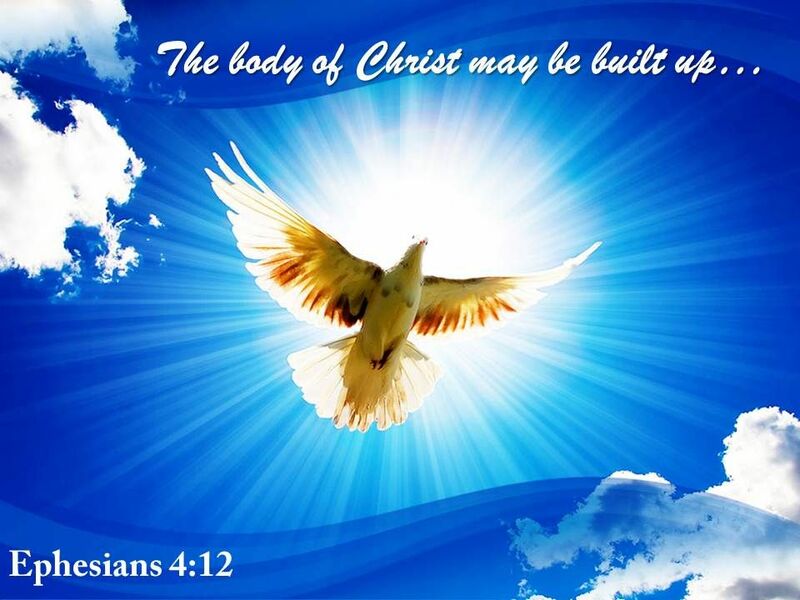 Thank God for the empowering of the Holy Spirit to those who are called to this task. The edifying of the body of Christ: To edify is to instruct or improve someone morally or intellectually. Synonyms include educate, instruct, teach, school, tutor, train, guide. Those who are gifted with teaching have a great responsibility, one not to be taken lightly.